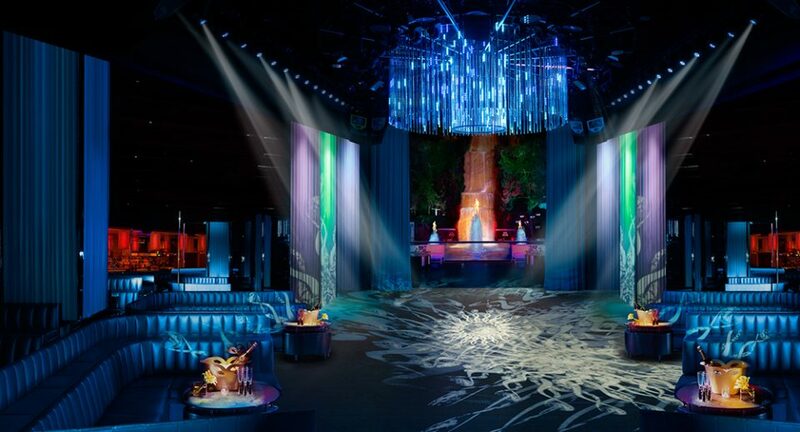 Wynn’s newest nightclub, Intrigue, is a thrill for the senses. Despite Intrigue being a more intimate venue than Surrender or XS, the club packs a punch for patrons with it’s many fabulous attributes. Boasting a state-of-the-art light and sound system, big-name DJs, and luxurious interior, there is something to satisfy all clubgoers. Also a sight to behold is the eye-catching water and pyrotechny off the patio, set against a backdrop of the club’s signature 94-foot waterfall. These striking outdoor features give Intrigue a stamp on Las Vegas nightlife all it’s own. Want to make an impression on all your social media platforms? Take advantage of Intrigue’s “selfie wall”: a wall that exhibits 32 rotating projectors which display images and words for all your photo ops. Craving more? How about choreographed pole dancers as part of your picture background as well? You will be the envy of all your followers when they see how your night at Intrigue unfolds. Whether you’re looking to have a full VIP evening with table service or just looking to have a few drinks and stay on the dancefloor all night, Intrigue is the perfect place to experience Las Vegas nightclubbing at it’s finest. The perfect mixture of posh and carefree, head over to the Wynn and take in the sights and sounds of Intrigue for yourself! Check out our Events Calendar and see what’s happening at Intrigue Las Vegas and view the Dress Code!